Well, this is the end of Christmas Ornamentation. I've enjoyed making these ornaments so very much, but as it comes to a close, I find myself short on time. And if I'm out of time, you probably are too! This last ornament is a printable, which is designed to be embellished a bit. 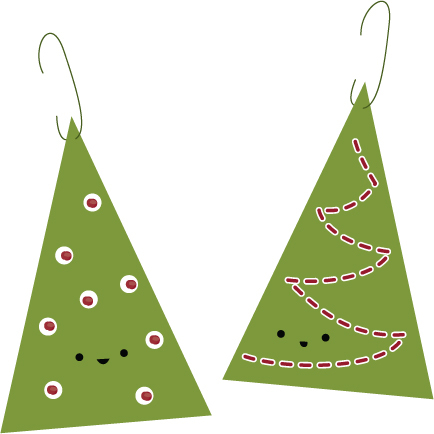 Download the PDF for this printable ornament here. In the PDF, the trees have the white you see above, but not the red. Why? So you can add some real stitches on there if you want! Of course, they look just fine left plain as well, making them a quick ornament to make. 1. Print the PDF on card stock. 2. Cut loosely around the double tree shapes. 3. Poke holes where you will stitch. 4. Stitch the decorations (french knot ornaments, running stitch garland). 5. Fold the shapes in half to make them double-sided. 6. Poke an ornament hanger through the top. If you're not adding the embroidery, just skip steps 3 and 4. Obviously, I skipped all of the steps, which is why I don't have a photo of it all finished! Somehow, time has been disappearing as I try to finish the last of the Christmas gift making. I'm so very close now! Anyway, I hope you've enjoyed making some Christmas ornaments with me! I've found that making gifts and tasty treats and decorations all throughout December really helps me enjoy the process of of Christmas...and not just the product. Ornaments leading to "the big day" has been such a joy!